From 1930 to 1950, the way to the "big bangers" was through the 350s, which were usually no more than slightly smaller versions of the 500cc bikes. This explains the popularity of this engine size, which was also highly favored for racing. The 350cc Model 50 was the mainstay of Norton, whose Birmingham factory made nothing smaller until the 250 Jubilee of 1958. This 350 appeared at the 1932 London Show and, except from 1940 to 1955, remained in the catalogue until 1966, evolving dramatically over the years but always retaining the same name, in . keeping with marque tradition. 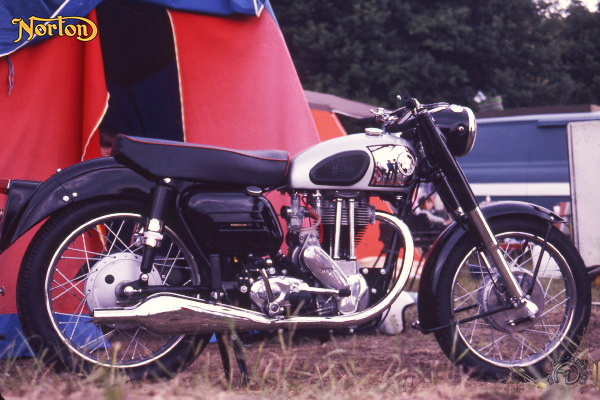 Nevertheless, during the last two years of production, it was known as the 50 Mk 2, for its Norton engine had been replaced by an AMC (AJS-Matchless) unit. The "50" was typical of the British bikes of its clay - an overhead-valve single with pushrods mounted on the right, dry-sump lubrication, magneto ignition, separate fourspeed gearbox and tubular frame. The same specification could also be applied to the 500 ES2, or the 600 Type 13. The fate of this 350 was to be practically identical to its big sisters, lighter by just a few pounds but also 20 percent less powerful. This 1956 model was built three years after Norton had come under the control of AMC and was interesting on two counts: It was the first 350 with the lightalloy cylinder . head, which had been launched on the 1952 500 E2, and the last new model with a Norton gearbox. After 1957, an AMC box was fitted. This remarkably original1956 350 Model 50 even retains the distinctive muffler so typical of the marque at this period.